An “up-DoWn” evening, but good overall….. When writing about restaurants, one should always compare ‘fondants’ with ‘fondants’ – so to speak. Fine-dining establishment DW eleven-13 currently enjoys 7th place on Eat Out’s ‘Top 10 Restaurants in South Africa.’ So, DW will be appraised relative to the standards of other Top 10 restaurants where I have eaten (all but two). We went to DW for the seventh time so that visiting friends could try a food and wine pairing. Chef Marthinus Ferreira has introduced a 6 course tasting menu, so this seemed a good option. DW has cleverly made its rather unfortunate location (on the lower level of the unsightly Dunkeld West Shopping Centre) work to its favour. A classy façade distinguishes it from its neighbours. The space itself is modernistic; gorgeously decorated with contrasting African urns and artefacts, sophisticated wallpaper and classic white table settings. The lighting is soft and the ambiance serene. We had informed DW in advance that we would all order the tasting menu with wine pairing. For some reason, this was interpreted as negating the need to see a wine list. When it was eventually brought to us we followed the recommendation of our wine steward and ordered a bottle of Genevieve MCC Blanc de Blanc 2009 to toast our friend on her birthday. Why do I feel so indignant about this when we knew what we were in for? Because every other Top 10 restaurant where we have eaten has happily accommodated this shellfish allergy. The request doesn’t seem unreasonable, does it? Shellfish can be lethal to those who are allergic. While restaurants can’t be expected to cater for everyone’s foibles, it’s not as if we asked for a carb-free, low fat meal! I am left wondering what makes DW so self-important that allowances for diners with legitimate (medical) dietary requirements cannot be made. It affects such a small portion of the menu. Too much to substitute one dish for another? Our friend would have been happy with an extra plate of conciliatory amuse bouches. Instead, we all sat there eating our prawns – he hungrily watched us. This did not make for a happy start to the meal. To add insult to injury, he still had to pay full price for the menu! The message seems to be: ‘Like it or lump it, if you can’t eat something on the tasting menu then order a la carte and spare us the trouble.’ Not the most winsome of attitudes. So, the un-pleasantries out of the way, the prawn ragu was actually rather tasty. Three juicy, perfectly cooked prawns, served on a delicate tomato compote, drizzled with lemon butter. These subtle flavours worked well and were complimented nicely by the Champagne, Marguet Brut Rose. The second course of springbok tataki and springbok tartare was a favourite at our table. Tataki, meaning ‘pounded’ or ‘hit into pieces’ is a Japanese dish. A thin slice of meat or fish is seared, seasoned with vinegar and rubbed with a paste – pounded from a variety of spices. The DW tataki was lightly smoked (something the restaurant has truly mastered) and the tartare was wonderfully rich and flavoursome. Several inspired accompaniments brought these components together: nori (thin, dried seaweed), beetroot gel and parmesan spheres to mention but a few. The wine choice of Rainbows End Cab Franc 2010 originally struck me as odd – a red right at the beginning of the meal. However, it worked like a charm. The Loch Duart Scottish salmon with butternut puree was lovely. Salmon soft and luscious, the butternut added smokiness and gentle sweetness, and pink grapefruit a dash of acid. The whole dish was topped off with super-crisp fried salmon skin – brilliance in terms of texture. Served with Hermanuspietersfontein Bloos Rose, another cleverly selected wine pairing. An unremarkable palette cleanser of orange and Pimms slush followed. 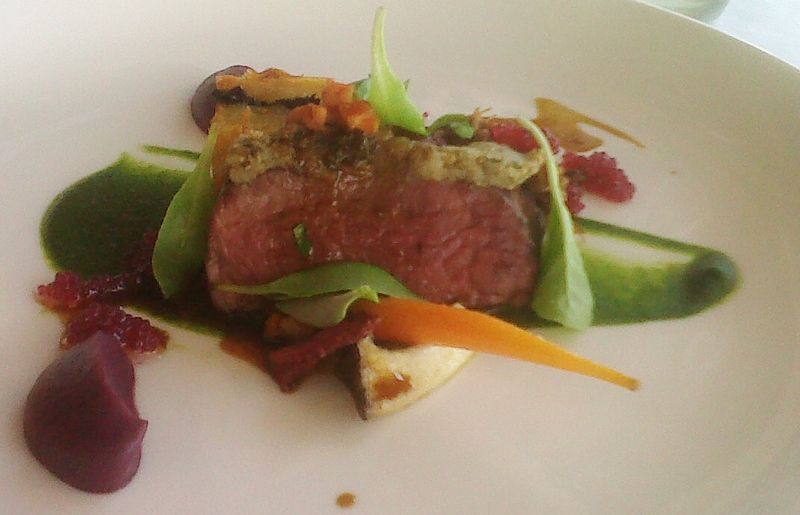 The main course was my absolute favourite, a succulent fillet that melted in the mouth. It was topped with tantalizing rounds of rich, scrumptious bone-marrow. 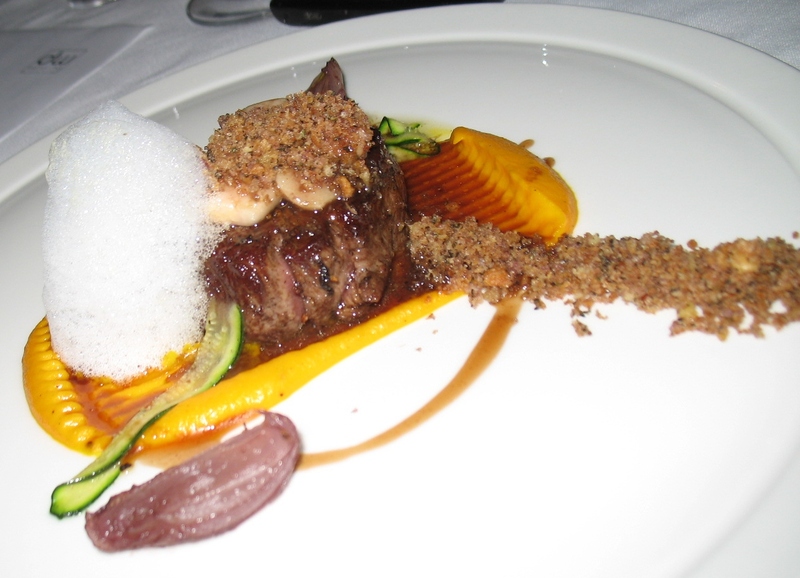 Accompanied by red wine and garlic crumbs, carrot, courgette, onions and rich, deep beef jus, the dish was a triumph. 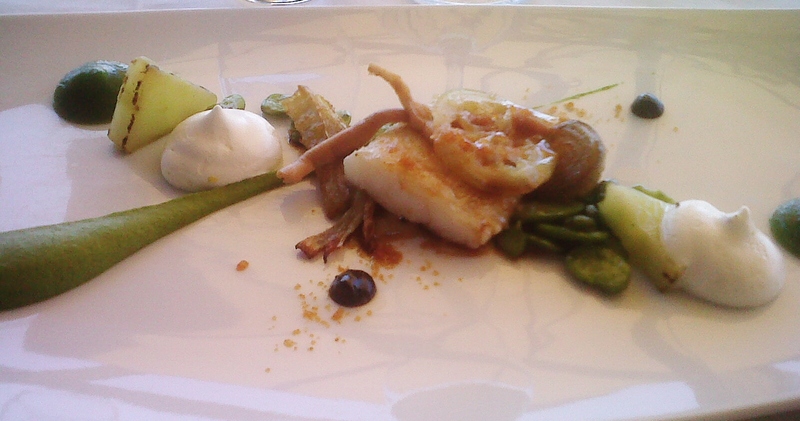 This was served with a complex, fruity Capaia Red Blend 2009. Not a well-known wine, but do try it if you get the chance, it is quite wonderful. The cheese course was an epicurean revelation. A round of white, creamy goats cheese layered over with a delicate peppered-pink guava jelly. Shallot vinegar caviar – still fabulous (you can read more about it in my review of Cube) – completed the dish. Bursting with flavour, we were all surprised and cheered by the cheese course and the lip-smacking Surin ‘Burlesque’ Straw Wine 2011 which attended it. A pudding of dense Valrohna chocolate tart with chocolate sorbet, chocolate soil and honeycomb helped to end the meal on a high. This was served with a Catherine Marshall Myriad Dessert Wine, 2007. Special attention to detail was evident in the wine pairing. Highest compliments to Patson, who used to be a waiter at DW and is now the wine steward. He explained each pairing to us in detail, was immensely personable and clearly deeply passionate about food and wine. The wines were very well chosen to compliment the dishes. Evidently DW is committed to the development of its staff, and it was heartening to see that there is such opportunity at the restaurant. The service was variable. Some staff were really warm and kind, others seemed irritated or disinterested. Food was served before the wine on one occasion and we eventually asked for the wine ourselves as nobody had noticed this rookie error. Small things matter. Always. But much more so at one of the best restaurants in the country. The little irritations of our meal were certainly a pity. I firmly believe that eating out is as much about the joie de vivre as it is about the food. 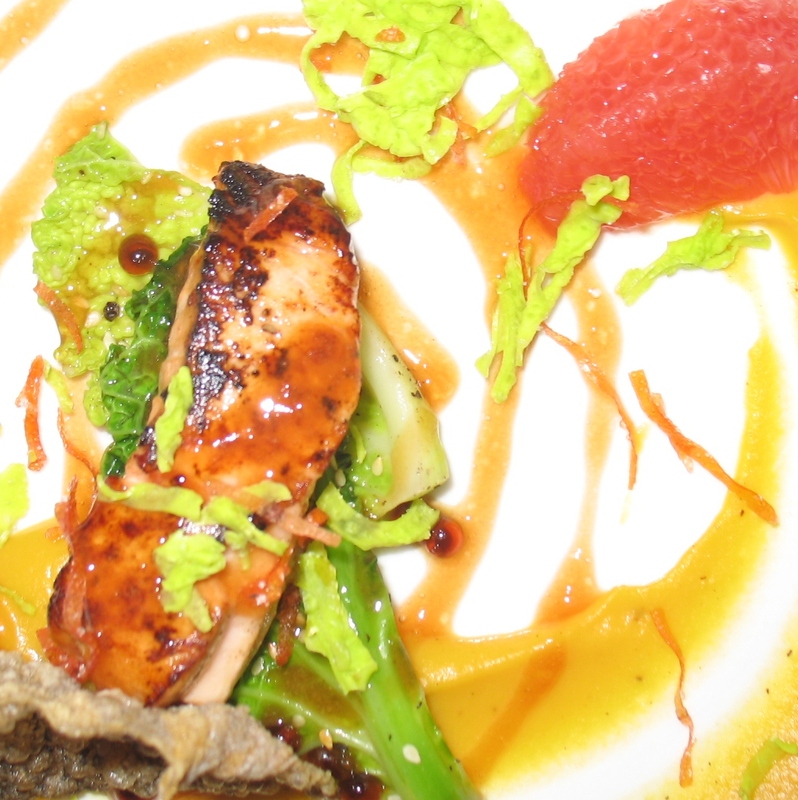 Endeavouring to keep diners happy should be a prioritiy for a Top 10 restaurant. I do like DW eleven-13 and the food was excellent. I recommend the tasting menu, but those who have dietary requirements should proceed with caution. 5 tasting menus, 1 bottle of MCC and 5 other beverages cost R 4800.00 including tip.